The San Martino Church in Lucca is a true Romanesque masterpiece, with its beautifully carved grey and marble front facade, which is actually a great porch and its ample bell tower which leans ever so gently against the church. This stunning facade, made up of a series of columns, is perforated like lace and projects a unique display of coloured figures and shadows, which continually change throughout the day, using the light. The amazing light game, which can be seen inside the church, is made even more spectacular by the stark contrast it has against the eerie darkness and silence of the church’s interior. The stunning porch, is truly a world unlike any other with figures of every shape and form placed at absolutely every angle. These figures, which can be seen on the ceiling, walls and columns of the porch, include those renenacting famous religious scenes such as the Apostles and the Virgin, the Kings bearing gifts for the Baby Jesus and the unmistakable scene of Jesus’ crucifixion. Then there are countless statues of prophets, biblical monarches, snakes and lions. Scenes depicting the Virgin Mary’s family tree, saintly characters attempting to resuscitate the dead, hunting the Devil or celebrating Mass, the signs of the Zodiac and many other mysterious scenes are displayed throughout the magnificent entrance to the San Martino Church. Finally, there are also several figures of San Martino himself with a beggar. It almost seems as if there is some sort of reference to all aspects of the Medieval world on the church’s marble surfaces. On one of the porch’s many pillars is a map of Dedalo’s Labyrinth on which the words …..Nobody has ever managed to escape safely, except Teseo, thanks to Arianna’s thread are engraved. These words are an invite to actually enter the church, by crossing the threshold into the holy twilight zone which awaits you inside; a silent and mysterious domain. Here, amongst the thousands and thousands of manmade treasures, in a small temple, sits the Volto Santo, an authentic representation of Christ, carved by none other than Nicodemo, which miraculously reached Tuscany sometime around the 13th century. You may also be surprised to discover another set of figures of San Martino and the beggar on the walls of the church’s interior, which are identical to those which can be seen outside the church. These figures are actually the original sculptures, with those placed outside in the church’s porch therefore being a replica, and they add to the eerie atmosphere of the church’s interior as within this representation the man is engaged in a full embrace with a fantastic but slightly worrying animal. As we continue our journey, slowly making our way through this succession of strange and mysterious objects, we reach another door within the church which leads us to the most important and mysterious discovery of all. We come to the door of the Sacristy, which is the room of a church where sacred vessels and vestments are kept or meetings are held. On entering this door, an extremely beautiful face immediately catches our eye. This sweet yet distressed face belongs to a white figure carved by the ingenious Jacopo della Quercia, which lies peacefully in this room, illuminated by rays of light which gently brush past for fear of harming, or simply waking, the statue from its eternal slumber. It is in this same cautious manner that visitors to the church approach this mysterious sleeping figure, instinctively walking on tip toes so as not to disturb the absolutely silent atmosphere which surrounds her. We know well from guides and from art books that this statue of a woman lying on a stone coffin with a base decorated with little angels, is made from a single block of stone and is one of the best pieces of Renaissance sculpture. However, despite the fact that she is made from stone, the statue is detailed that she seems almost alive, locked in a deep sleep. In fact, many say that this beautiful young woman, with her hair so neatly tucked into floral bonnet which is fit to burst and her french style clothing, is just waiting for a gesture (or maybe even kiss like the famous sleeping beauty from the fairy tale) to awaken her for her deep sleep. Perhaps that is also the wish of the distressed little dog which sits at the foot of the statue fixing his master which only other dog-owners would recognise. Nevertheless, nothing happens. She remains completely undisturbed, unfortunately, and the rays of lights continue to dance upon the delicate curves of her body, lightly illuminating her sweet head perched so delicately upon a cushion and her hands which, resting ever so gently on her bosom, remain completely still. But who was this woman? There is absolutely no clue to be found on the tomb that could help us. However, various researchers have identified her as Ilaria del Carretto, the second of Paolo Guinigi’s four wives. Ilaria del Carretto married very young in 1403 and died only two years later on 18th December 1405, an premature end which was all too common for women of that era. Paolo, who was an extremely rich and powerful man in Lucca, was very fond of her and so he did not hesitate to immediately contact a great sculptor like Jacopo della Quercia to create a memorial statue of Ilaria which, although was initially for the funeral, continues to fascinate its every visitor. It was probably Paolo who wanted the figure of a small dog, knelt at Ilaria’s feet, to be included as a symbol of the loyalty he felt towards his beloved wife. Jacopo finished the statue in 1408. However, the tomb has most probably never held the corpse of Ilaria, which had been in the meantime buried in the Guinigi chapels in the 14th century San Francesco Church. Just a few years later, Paolo’s luck came to end and, betrayed by Filippo Maria Visconti, he was arrested and imprisoned in Pavia where he died soon after. As is always the case, the people of Lucca trampled on the memory of Paolo Guinigi and also the assets of this fallen tyrant. The Guinigi fortune was in the end confiscated and destroyed. 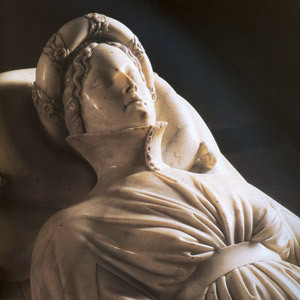 Even Ilaria del Carretto’s magnificent memorial statue did not escape such a fate as it too became dismantled (the little angels which decorate the tomb ended up in Florence and remained there until 1889 when they were finally returned to Lucca) and was placed next to the door of the Sacristy. Fortunately, struck by the statue’s great beauty, the people of Lucca did not dare to damage it anymore. Eventually, the tomb was moved to the left transept of the San Martino Church. Very few years later, the statue was moved back to the Sacristy, this time in the centre of the room however, which was then transformed into a museum. This was to allow for a better conservation of the statue. Nearby, the Madonna with the Baby and the Ghirlandaio Saints keep a close watch on the sleeping Ilaria whilst the diffused, subtle rays of light continue to caress the body of white marble. We live in hope that one day, just maybe, the young maiden will awaken and pass us the thread of the Labyrinth, the key to the mystery.